Why in the world do congressional committees interrogate people? I mean, I can understand if it's a budget issue and the agency in question is mismanaging the money given them by Congress, but why are they acting like prosecutors with swine like Peter Strzok? I read an autobiography of Nathan Bedford Forrest, the famous Confederate cavalry leader. Among his many victories was his capture of Fort Pillow. Yes, that's the real name of the place, Fort Pillow. 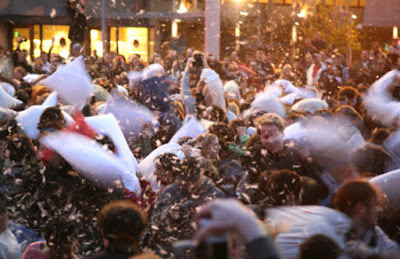 All I can think of is guys hitting each other with bags full of goose down and feathers flying all over the place. Ahem. I seem to have digressed. The Federals defending Fort Pillow included a unit of colored troops who were allegedly massacred by Forrest's men. Whether or not it happened and whether or not Forrest controlled it is a murky issue. It was played up in the North and at the end of the war, Congress held inquiries about it. Forrest was brought before a congressional committee just like Peter Strzok was this week. And just like Strzok, Forrest lied to them. He didn't even bother to keep his stories consistent during his testimony. In the end, the committee ran out of time for the hearings and nothing came of it. Nothing ever does. Nothing will come from Strzok's testimony, either. To my mind, everyone associated with Hillary's emails and the subsequent investigation is a criminal and should be prosecuted. That's not going to happen in Congress. Instead, we get this grandstanding rubbish followed by each side's partisans pulling out the portions that make their team look best. Strzok and his cronies walk and the nation is no better off. Please, can we do away with these? The capture of Fort Pillow. I think.